It’s here, there is no denying it. The holidays. Have you made your list and checked it a billion times? I am a major list checker, so it’s been checked a billion and a half times, I won’t deny that part. As I said earlier this week, I do take a step back though, making sure I enjoy the ride as much as I check my to do lists. It’s a bit lower key this year for us, not as many family members will be here. We are having six, including us, instead of eleven or twelve. So I decided to switch up one dessert this time around. As long as there is pumpkin pie for Brian, his family, and my brother, the other desserts are free creative reign department. So I wanted to play with persimmons this year for the third annual Ultimate Oregon Thanksgiving radio show with other lovely Portland Bloggers. Missy Maki is our fellow blogger and radio host! We get together and share a dish using Oregon ingredients, mostly found at our farmers markets, thus the persimmon apple tart was born. I puree the persimmons into a luscious sweet bottom, and sliced the apples but nestled them into the puree so they stay moist while baking. For a crunch texture I used Oregon hazelnuts, which are well know to be the best in business. Which is great because who doesn’t love hazelnuts? I choose to make the dessert for our Ultimate Oregon Thanksgiving every year. 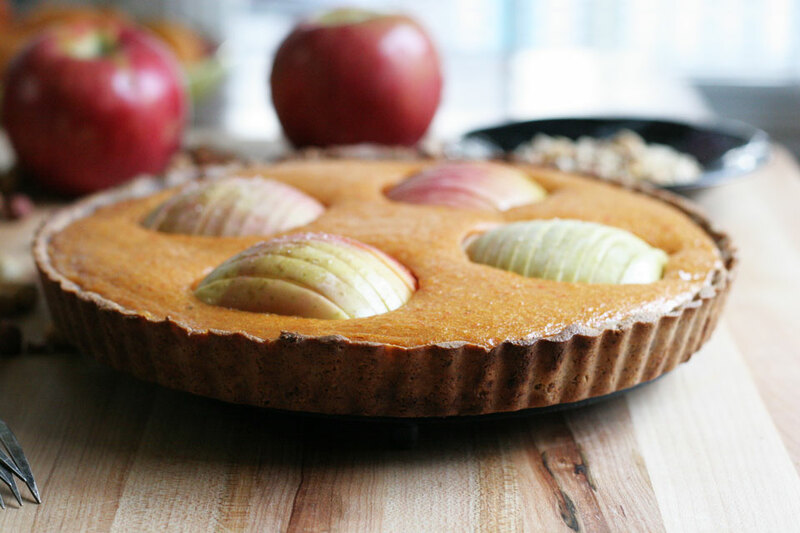 In the past I’ve made pie, or galettes, and this year I changed it up to this super simple tart crust. It takes just a few minutes to put together, and you can make it in advance. Just keep in in the fridge for a few days, and if longer time is needed, stick it in the freezer. It is easy as that! This dessert is also gluten free, which is cool because many of many blogger friends that will be on the radio with me are gluten free, so I can actually share with them! Tune into KPAM 860 on Sunday November 23 from 10am-12 for a radio show full of great tips for your Thanksgiving meal! Are you making the desserts for the holidays? Pan note: I used a 10 inch tart pan with removable bottom. If you do not have one, use a straight sided cake pan, or spring form pan instead. Place rack in center of oven and preheat to 400 degrees. 1. In the bowl of a stand mixer fitted with the paddle attachment add almond meal, butter, egg, sugar, and salt. Mix on low, then medium for a few minutes until combined well. Place dough in the tart pan. Using your fingers, press the dough into the pan evenly and up the sides. Using a fork, poke the entire tart. Place in freezer for 15 minutes. Remove from freezer and place in oven, bake for 10 minutes. 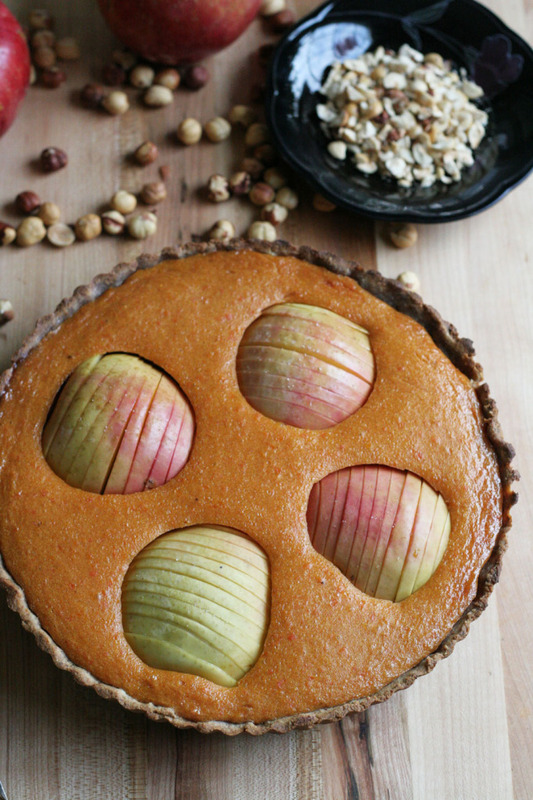 While the tart crust bakes, place persimmons, sugar, and salt in a blender. Blend until smooth. 2. Remove tart crust from oven and carefully pour the persimmon puree into the pan. Place the apple slices in the puree, be sure to nestle them into the puree. Place back in the oven for 15-20 minutes, until crust is golden brown. Remove from oven and allow to cool for 30 minutes. Sprinkle hazelnuts on top. Serve with whipped cream or cream chantilly. 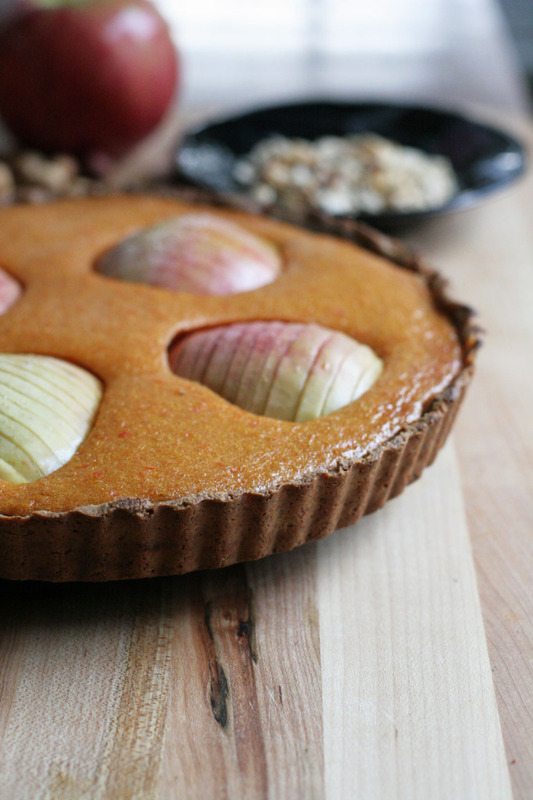 I love everything about this tart. Pinning to make sure I make it soon. 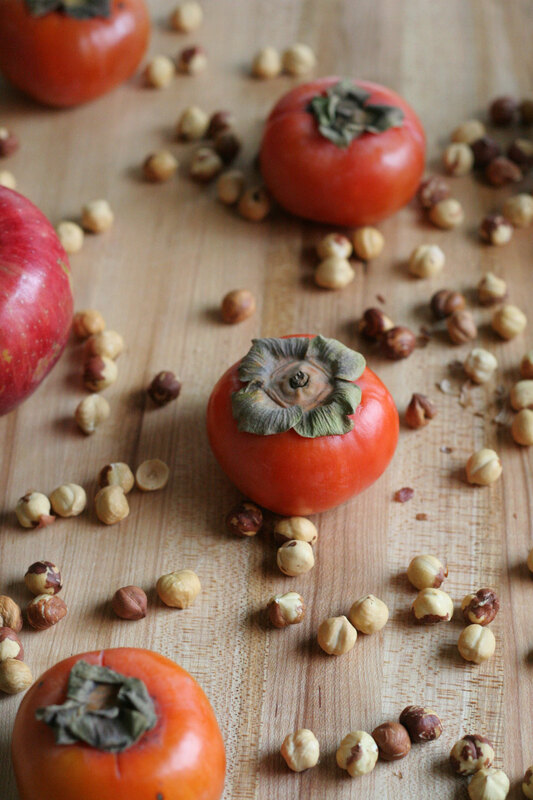 It would be perfect over the holidays now that the markets are full of gorgeous persimmons! This presentation is so different and fun! A wonderful idea for Thanksgiving! Laura recently posted..What the heck is a Jewelry Bar?? O2 Style! Yes… somehow the holidays slipped in and I didn’t even realize it! Like you I’m trying to enjoy the ride. I tend to get so wrapped up in making everything perfect that I stress and my daughter has mentioned I kind of stress her out too. I’m working on that. And baking helps!! My mom adores persimmons, but I’ve not always known what to do with them. This one is a keeper! Gosh, me too. It is ironic, it’s family time, a loving time, but we are all walking around pulling our hair out trying to make everything perfect. It is a balancing act for sure. I am just in love with persimmons! 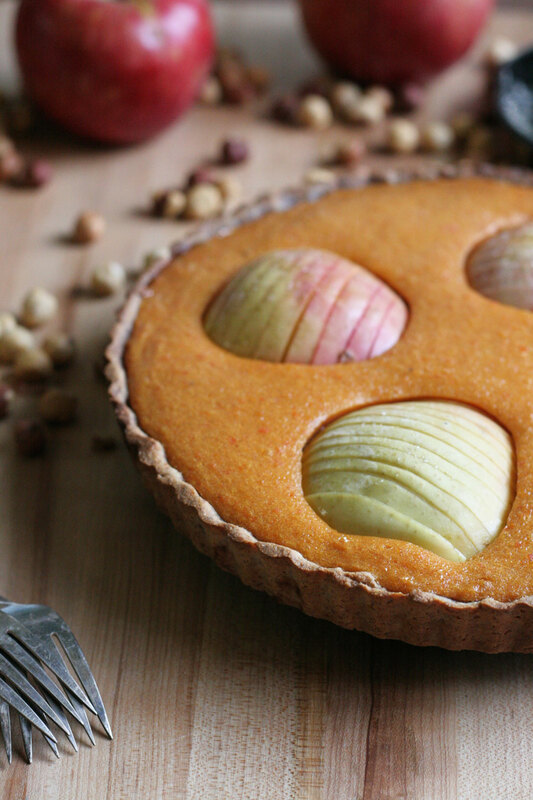 Your tart is so striking! Thank you, Dorothy! I appreciate that very much.